A new and exciting range of powerchairs utilising Dan's designs is now available from dragonmobility ltd.
Visit their website for the latest information. If you want to look people in the eye, and take on all that life has to offer, the DRAGON might just be for you. If you expect an active lifestyle, it doesn't matter about your age. Children, teenagers or adults all might like to try it out, provided you weigh less than 75 kilos/12 stone. The DRAGON Mark II has in mind the new generation of integrated young people who like to get their own drinks from the bar, travel freely on accessible public transport, or drive their own car from a wheelchair. They may want to get to college, earn their own living, go out with friends, have fun with their family, travel the world even - whatever they have the gifts for. The DRAGON Mark II also has in mind the little ones for whom mobility is vital before immobility restricts their horizons. People learn 50% of everything they ever know in life before they are 5 years old. The DRAGON seeks to help pre-school children learn positive things about themselves that will stay with them for the rest of their lives. The DRAGON Mark II is designed for anyone who wants a power chair which gives them versatility of movement. It's designed for those who want high performance and responsiveness, and who want one machine to cope with as many of their chosen activities as possible with the minimum adaptation of their environment (see our design principles). The DRAGON is designed by Dan Everard, the pioneering designer of the TURBO, which revolutionised children's wheelchair provision in the eighties. Anyone who used a TURBO Mark VI as a child may think they don't have to ask how special the DRAGON is, but they should, because in many respects it's even better than the Turbo was. The Dragon MarkI prototype was built in 1995. It was developed further over the next nine years and tested thoroughly by Dan's daughter Ruth, in daily use through school, university and then in the workplace. Other users of prototype Dragons followed by Dragon MarkII users have given vital feedback from daily experience over the years. It has seat elevation higher than the Turbo had, and still goes right down to the floor. It has better suspension and handles rough ground comfortably and easily. It has greater battery-range per charge, and its battery-friendly electronics look after batteries so they last longer, using the lightweight charger. It goes faster - just under 8 mph, but for pavement use can be limited to 4 mph. It is quieter, due to a simple drive system, with the minimum number of moving parts. It has smaller, more reliable motors, that are 50% more powerful. It spins on the spot with the driver at the centre of perception, and is smaller than the Turbo, so manoeuvres round the tightest corners for all types of indoor use - home, work, school, college, shops, clubs etc. The seating (or standing) can be custom fitted to your requirements. So whatever your needs, you can be properly supported for optimum function and posture. The control system is programmable and sophisticated, to meet different needs, and give a really smooth ride with total control. The elevation can be used to operate a clamping system to let you drive a car from your DRAGON (see photo). It is designed for easy servicing and modular replacement of worn parts, for maximum reliability. 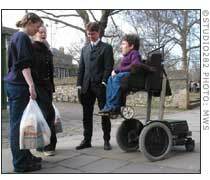 To talk to someone, or book a trial, contact dragonmobility.